Good news for outdoor trail photo enthusiasts! The Spypoint 6mp Invisible Infrared Game Camera is now available to help you scout game without spooking the participants. It has awesome features like invisible black LEDs and five zone sensor that makes it a really popular model. The sensor allows it to capture good quality centered images at a fast trigger speed. The Spypoint Camera is also very easy to program which makes the user able to get extensive use out of it. It has a wide detection zone and excellent infrared range which allows for taking photos even at a distance. Daylight photography is superb, providing beautiful quality and clear colored photos. Aside from these, the camera has 32GB storage that enables the user to store hundreds of photos without having to keep on transferring it to another place. It also has a battery of life of three to four weeks, allowing the enjoyment of using the camera lasts longer. A downside of this camera is that it is difficult to capture a good quality photo at night (for great night photos, I recommend the Moultri 990). Moving objects may be a struggle to catch and may come out blurry. Macro objects tend to white out also when shot up close. But aside from these few cons, the Spypoint Camera is one of the best there is on the market today. Other models are certainly struggling to keep up with it. 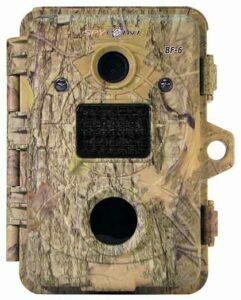 Looking at the Spypoint 6mp Invisible Infrared Game Camera, I consider it to be a great game camera. The shutter speed is a little slow for night photos, but the ease of use and battery life are big advantages. Overall, a really solid option.